Ok I have my relay board in and was going to being the setup of my remote Raspberry Pi 3. As far as Mono goes, it looks like people are talking about problems with the current 5.16 version of Mono... What version of Mono, should I use? Any other advice on the setup of my Pi 3? any version of mono >= 4 should work. problems with mono 5.16 are specific to ASPX pages, which this plugin doesn't use. I have it working! Thanks so much! Mono took a very long time to install for some reason. I did notice that when you go into the "PLUGINS --> Manage" screen I do not get the same of the Plug-In, just the name of the Instance in the "Remote Plug-Ins" section. Does not seem to matter, I was just curious as to why? It's a known HS3 bug, I reported it to Rich. Thanks! So far all is working well! Thanks again! Spud, I came across a major problem that I am not sure how to resolve. When the Plug-In initializes on the Raspberry Pi it is energizing all the relays. Regardless of the state of the relays before, if I power cycle the Raspberry Pi, every relay comes back on energized AFTER the plug-in initializes AND then communicates back to HomeSeer. 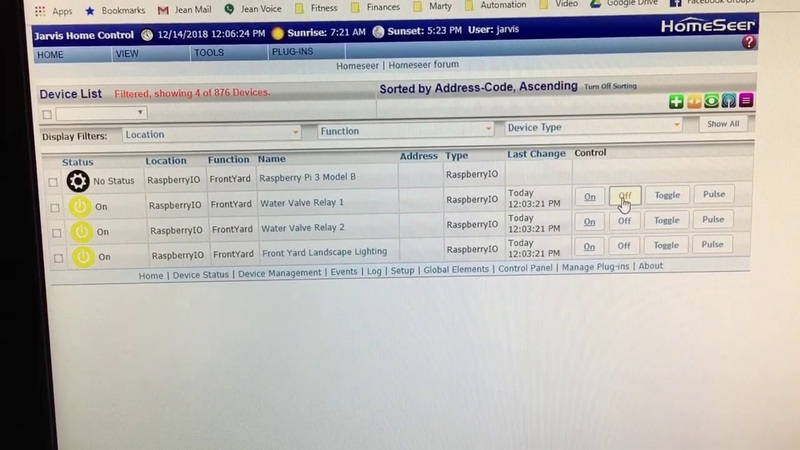 If the Raspberry Pi is not allowed to talk to HomeSeer (by removing the network cable on power cycle) then the relays do not energize when the plug-in initializes. Once network connectivity is restored then again all the relays energize even though they were set to off in HomeSeer. Here are the logs with debug and a video. Also, it does not matter if I reverse the setting in the plugin or not. Is this normal behavior to energize all the relays after the RaspberryIO Plugin comes up at communicates with HomeSeer? Here is the Dubug Log... Read from latest on top to earliest on bottom. Please try version 3.0.0.15 available in the Beta section of the updater. This version has an "Init Value" parameter for output pin. Setting it to "From Device" or "Off" should fix your issue. Spud, no change at all.. Am I supposed to configure something with 3.0.0.15? I updated it on the Windows HomeSeer system, is there an update for the version running on the Pi? I then rebooted both the HomeSeer system and the Pi. I once again turned off all the Relays and rebooted the Pi, and after the Pi came back up, communicated with HomeSeer, it then turned all the Relays back on! Jeanv, Since I have this connected to my garage doors, I'm going to try this myself. I'd hate for the garage doors to open if the power goes out then comes back on, especially if I'm away from home. Yikes! Spud, no change at all.. Am I supposed to configure something with 3.0.0.15? I updated it on the Windows HomeSeer system, is there an update for the version running on the Pi? yes you need to install .15 on the RPi. There is a link in the user guide for the new remote zip. then go to the config page, you will see a new column called "Init Value". Set that to "From Device" pr "Off"
Spud, that did it!!! I am using the "From Device" setting and it works exactly as I would expect. If HomeSeer has the Relay OFF, then the Relay STAYS off after a reboot of the Pi. If HomeSeer has the Relay ON, then the Relay energizes once the plugin connects to HomeSeer. This is what I needed to see! dzee, yes, I would be very concerned if power fails and comes back on to the Pi that with the previous version it would energize the relay and open the garage door. The new version seems to address it. When I got home from work yesterday, I unplugged the remote Raspberry Pi running RaspberryIO, gave it a minute, then plugged it back in letting it run for two minutes and the relays did not activate. I'm still running RaspberryIO v 3.0.0.12. The relay energizing on boot does not appear to be a problem on my system. My Plugin Manager screen shows 3.0.0.14 as the latest version, and I see 3.0.0.15 is in beta according to Spud's comment above. Seems I'll just leave everything alone, and maybe update directly to 3.0.0.15 once it comes out of beta. Very strange. I can tell you that the code update did fix the issue for me. Did you kill the power to the Pi and then power it up again? You can see the behavior mine had in the video. I noticed if you did not give the Pi the ability to connect back to HomeSeer it would not energize the relays. Spud got it working with the options to be able to tell the relays how to behave when the plug-in connects. Now if I could just get the inputs working as reliably I would be all set. It was working before 3.0.0.14, because in version 3.0.0.14 I changed the behavior so that it's possible for another program on the RPi to change a GPIO output without the plugin to revert the change when it is initialized.